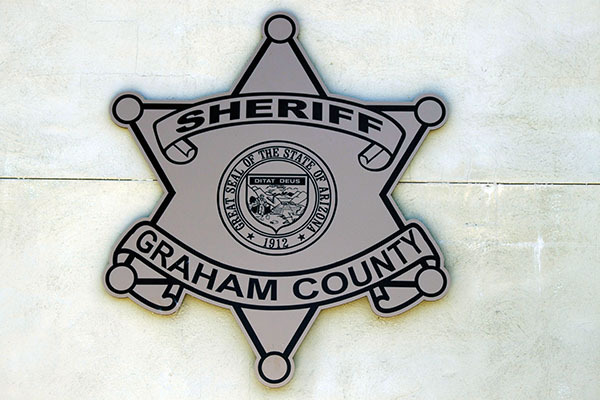 TOPICS:Graham County Booking ReportWho Got Busted? Following is a listing of bookings from the Graham County Jail from March 6, 2017, through March 12, 2017. All information is from the jail’s booking roster. While the following have been incarcerated, each person is considered innocent until found guilty in a court of law. Donald Helman, 61, commitment order, self. Alexander Kamae, 21, commitment order, self. Alex Knotts, 25, warrant, SPD. Vincent Congdon, 26, warrant, SPD. Jason Lawler, 32, aggravated assault, resisting arrest, unlawfully administering intoxicating liquors, narcotic drug or dangerous drug, PPD. Eric Harris, 51, warrant, GCPD. Emily Garcia, 27, warrant, GCSO. Tyler Sawyer, 19, warrant, SPD. Randy Morales, 26, warrant, SPD. Alberto Baeza, 34, warrant, GCPD. Pedro Ogas, 32, disorderly conduct, assault/domestic violence, SPD. Levi Roberts, 27, probation hold, GCPD. Casey Bright, 20, warrant, GCSO. Jeff Granatowski, 51, warrant, TPD. Cindy Ticer, 46, warrant, GCSO. Vina Baxter, 41, probation hold, GCPD. Brett Wheeler, 24, possession of marijuana, possession of drug paraphernalia, DPS. Andrew Ruiz, 22, commitment order, self. Randy Morales, 26, probation violation, GCPD. Julian Jacquez, 38, warrant, GCSO. Tryon Reed, 27, warrant, SPD. Keith Gatewood, 55, warrant, GCSO. Brady Huffman, 30, warrants, SPD. Cynthia Borns, 56, commitment order, self. Destiny Hall, 27, warrants, GCSO. Delores Thompson, 52, warrant, TPD. Cora Young, 38, warrant, SPD. Seanery Mendoza, 38, possession of a dangerous drug, possession of drug paraphernalia, tampering with physical evidence, DPS. Quana Salt, 43, courtesy hold, GCSO. Kenneth Pierce, 29, courtesy hold, GCSO. Robin Silva, 36, warrant, SPD. Charles Aros, 32, warrant, GCSO. Nicole Bencomo, 34, warrant, PPD.